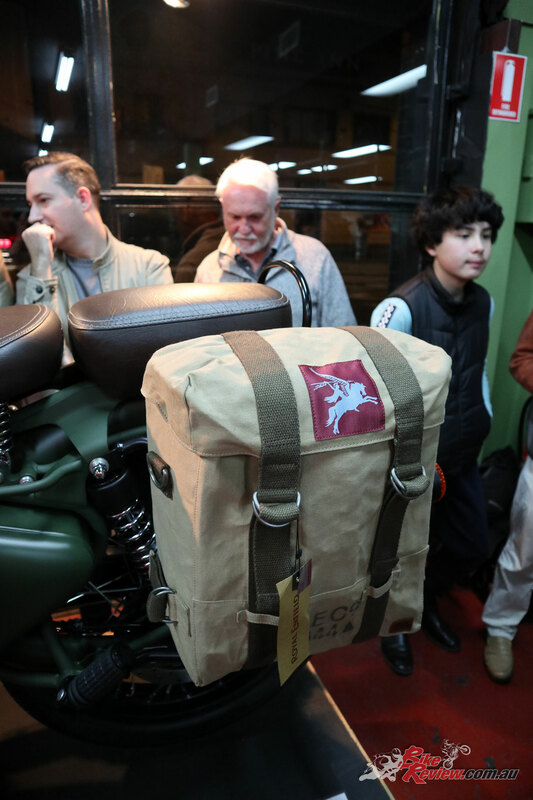 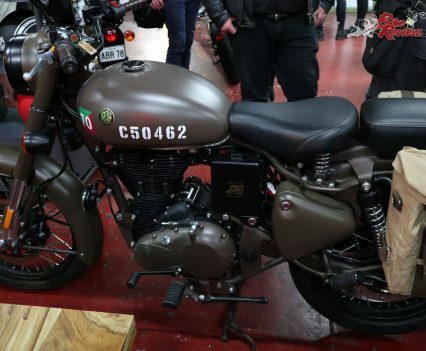 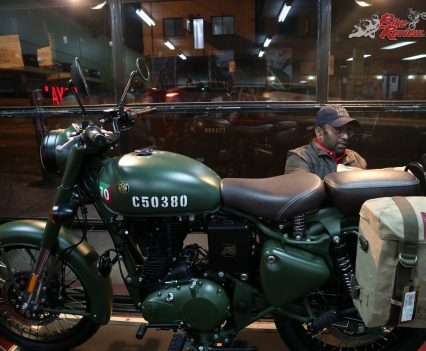 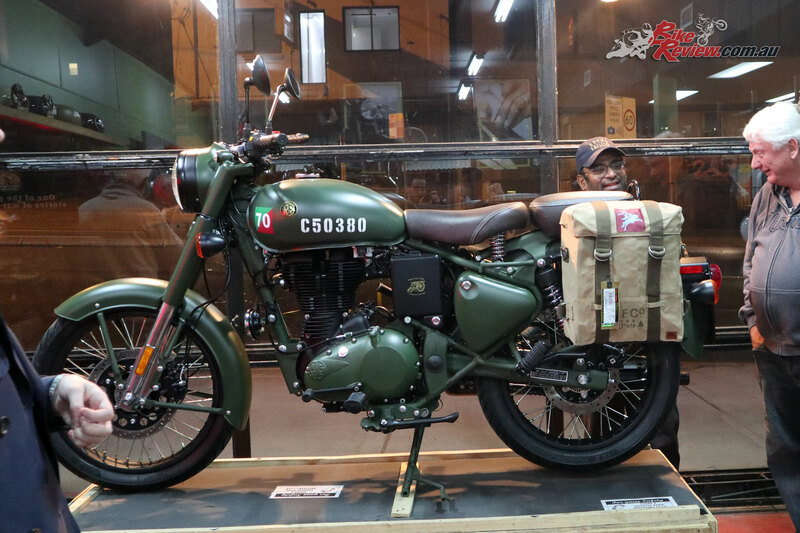 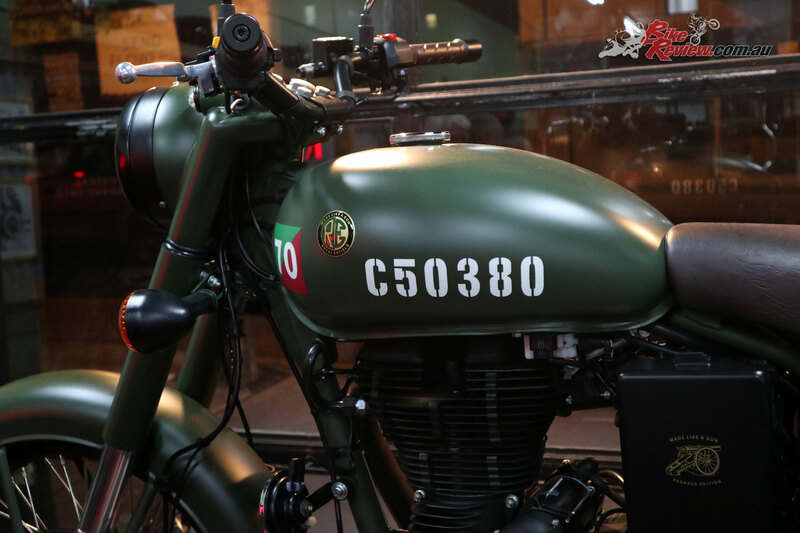 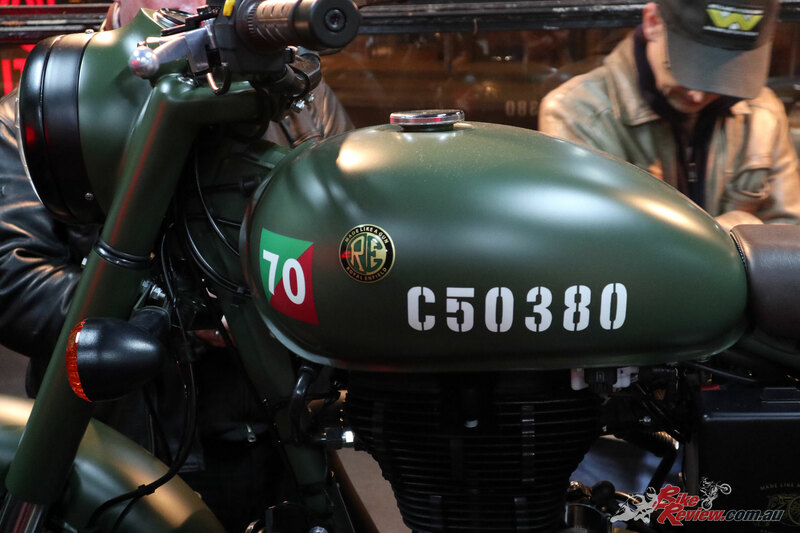 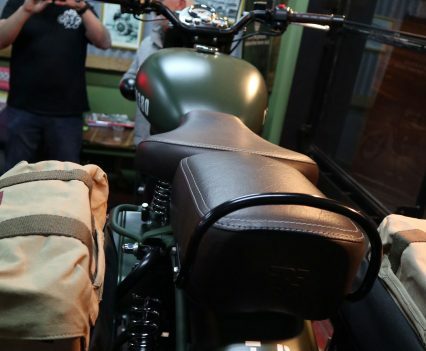 Royal Enfield, well known for their authenticity and long history, caused quite a stir with the announcement of the Limited Edition Pegasus, a Classic 500 edition, which recalls the brand’s proud history during both World Wars, and particularly the Flying Flea, made famous in WWII. 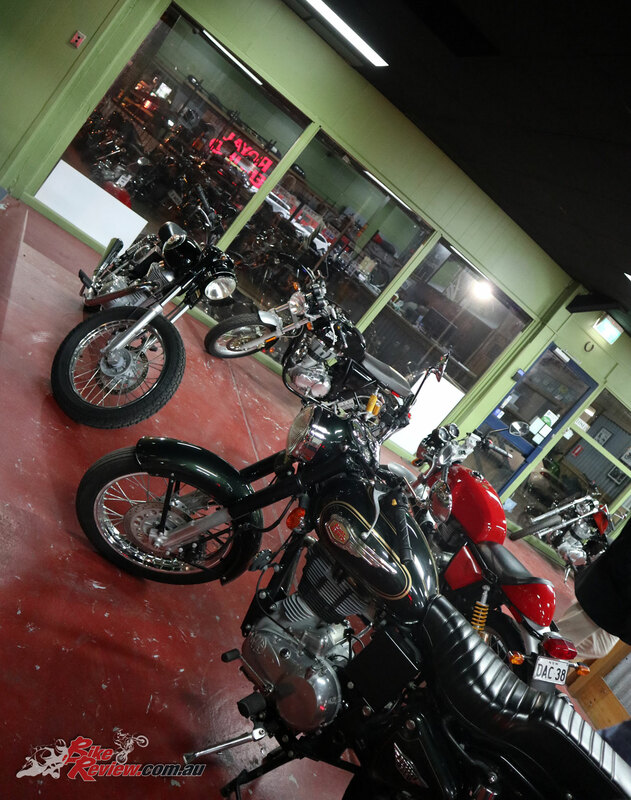 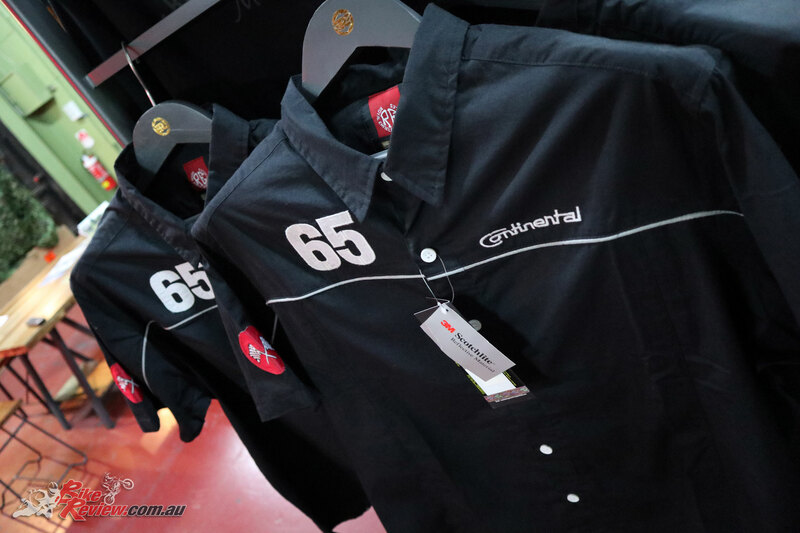 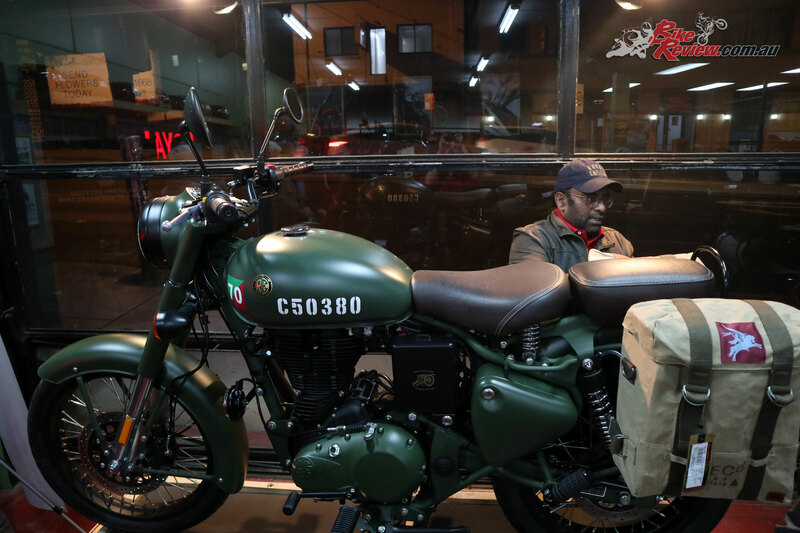 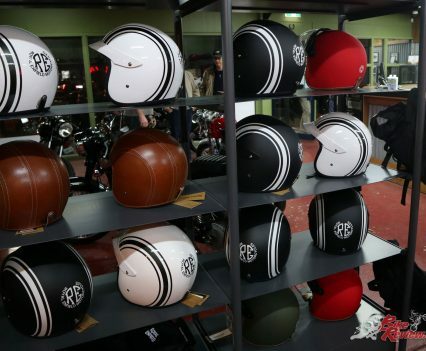 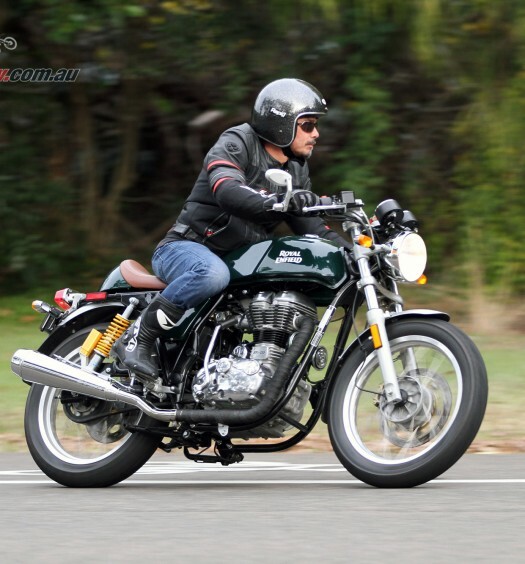 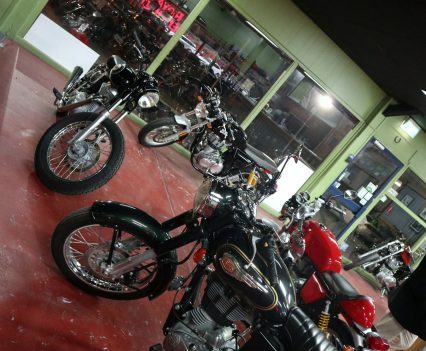 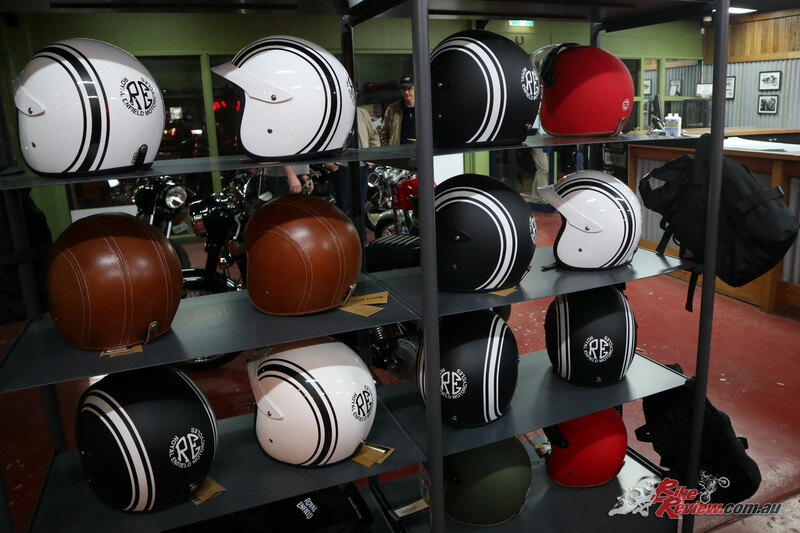 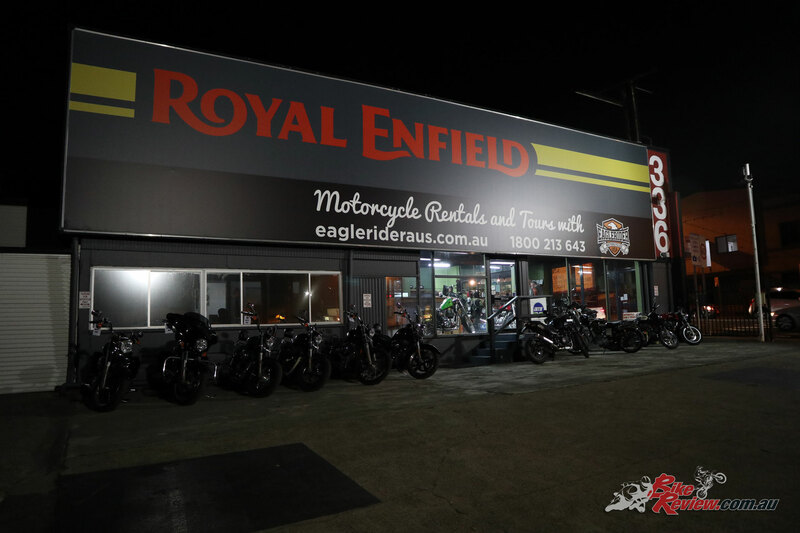 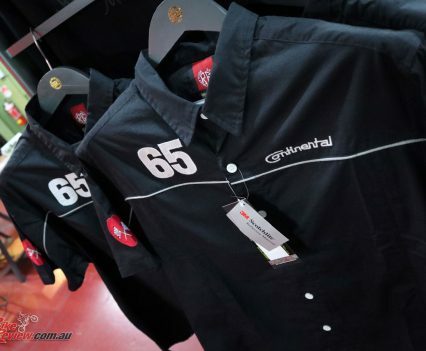 Royal Enfield Sydney – 336 Parramatta Rd, Burwood NSW 2134. 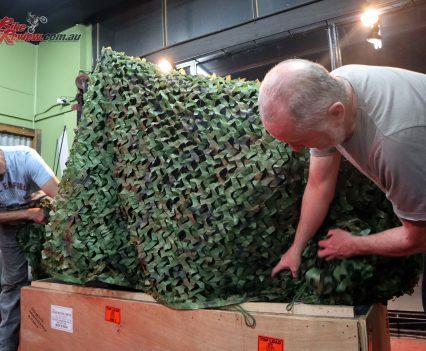 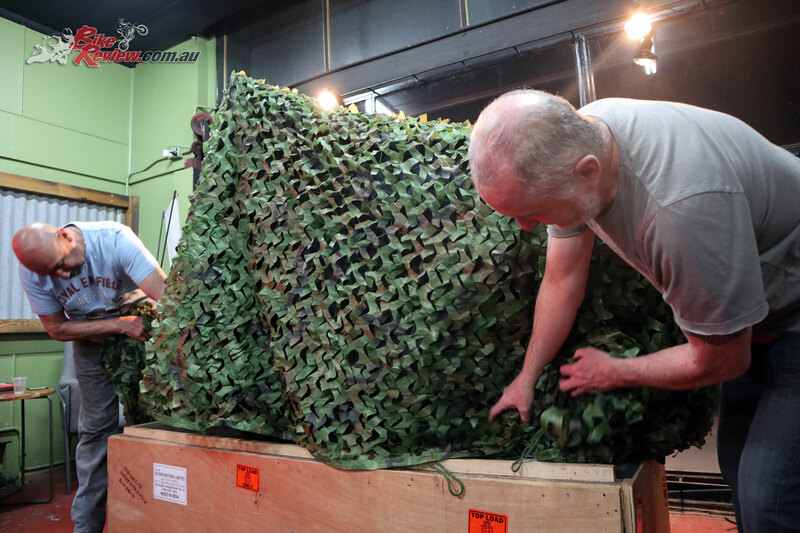 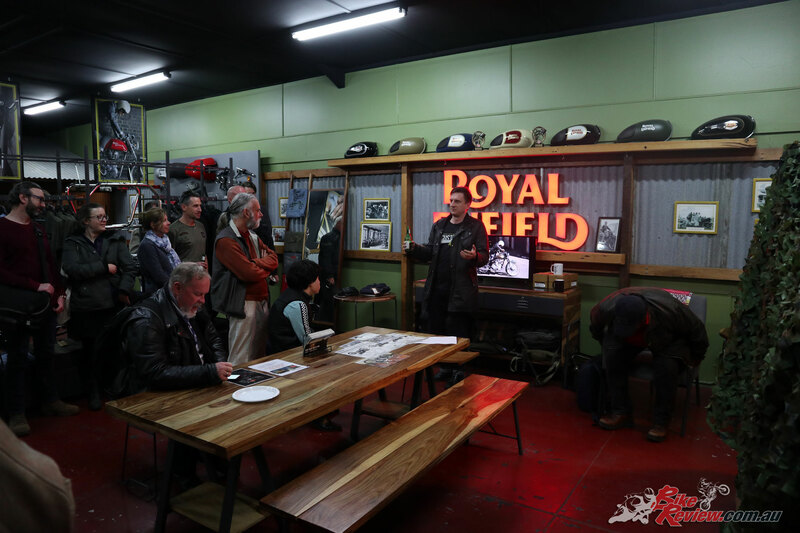 Last night saw Royal Enfield Sydney, as well as other Royal Enfield dealers around the country, holding an unveiling ceremony making for a very special experience for the lucky new owners of the Pegasus, as well as for those who came along for their first glimpse in the flesh of the very limited edition model. 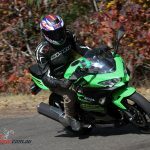 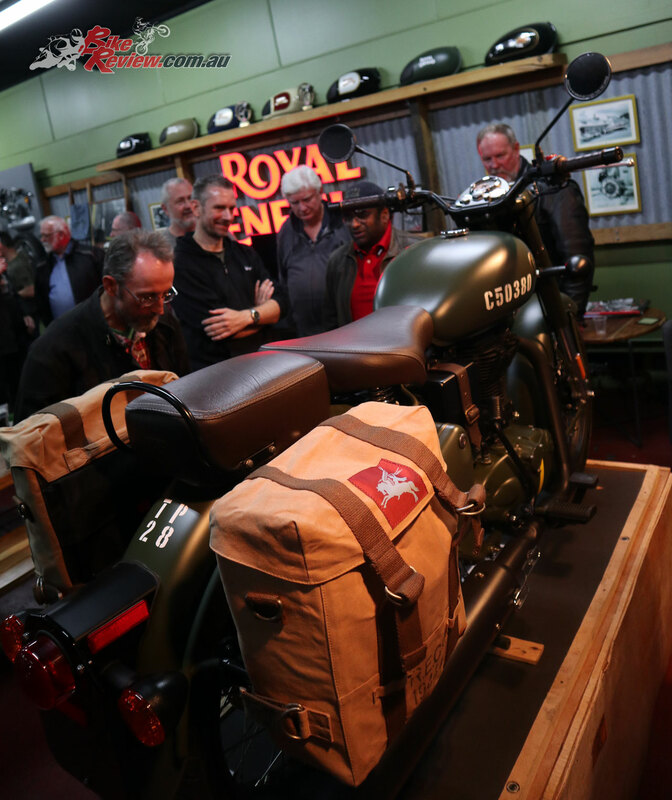 With only 1000 produced, and 30 coming to Australia, it’s fair to say these will remain very special, and a rare sight on the road, boasting a number of unique features, including the badging, special paint, panniers and CoG line, along with the Flying Flea inspired styling. 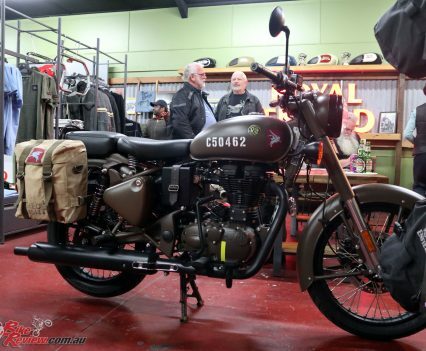 The Flying Flea was a 125cc Royal Enfield motorcycle dropped in with infantry during WWII, allowing for greater mobility and advancement in incredibly tough conditions, and replaced bicycles which simply were not up to the task. 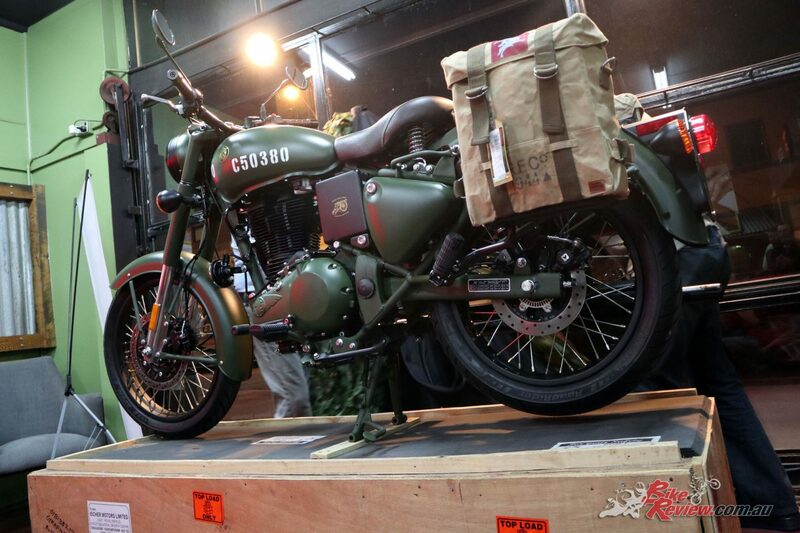 Light enough to be lifted across difficult terrain the Flying Flea is credited with making a considerable difference to the war effort. 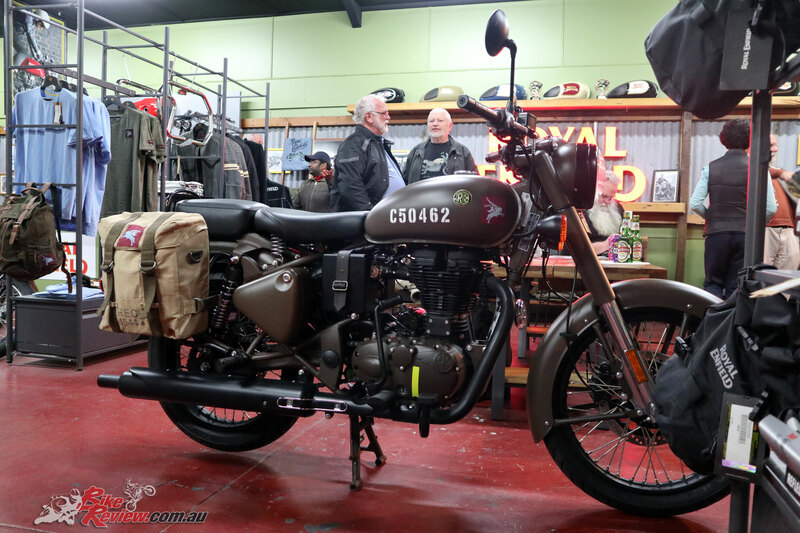 Jonathan Gibson shared some of his traveling experiences on a Royal Enfield – Including an 18 month trip from Sydney to London. 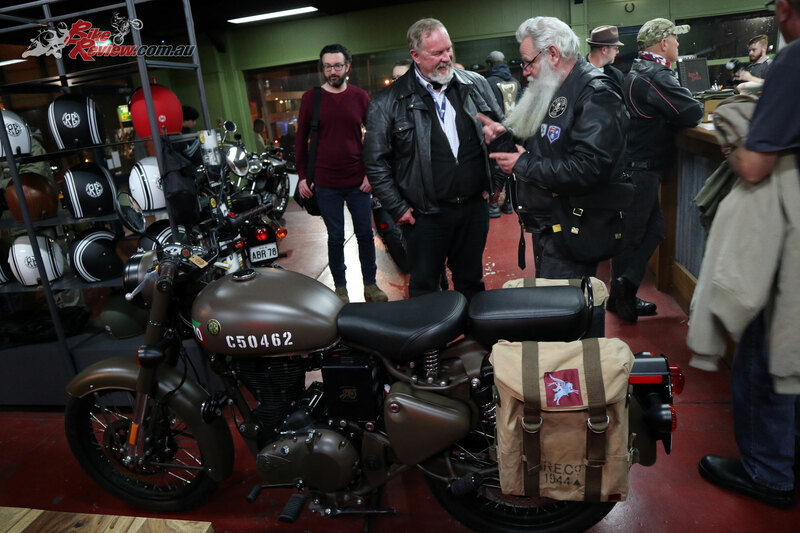 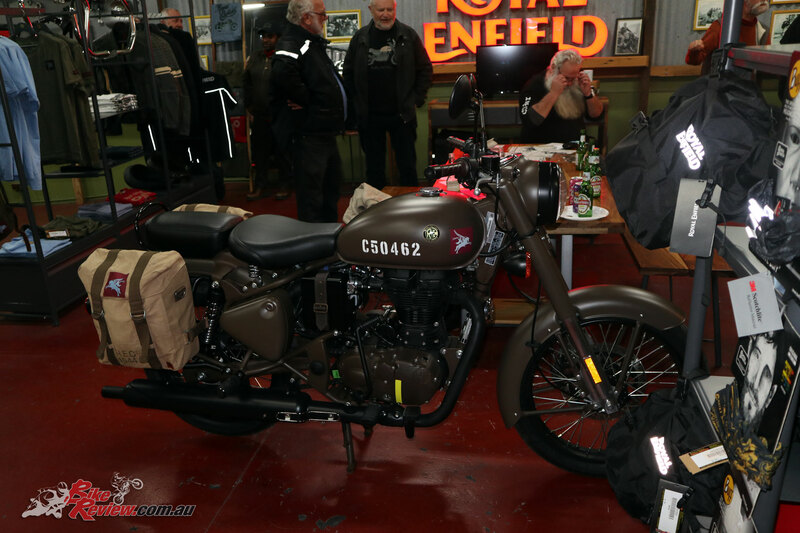 Making a special appearance at the Sydney event was Jonathan Gibson, who’s ridden from Sydney to the Ace Cafe in London on a 1969 Royal Enfield Bullet in a journey which took 18-months, sharing some of his experiences and representing the passion behind owning one of these machines. 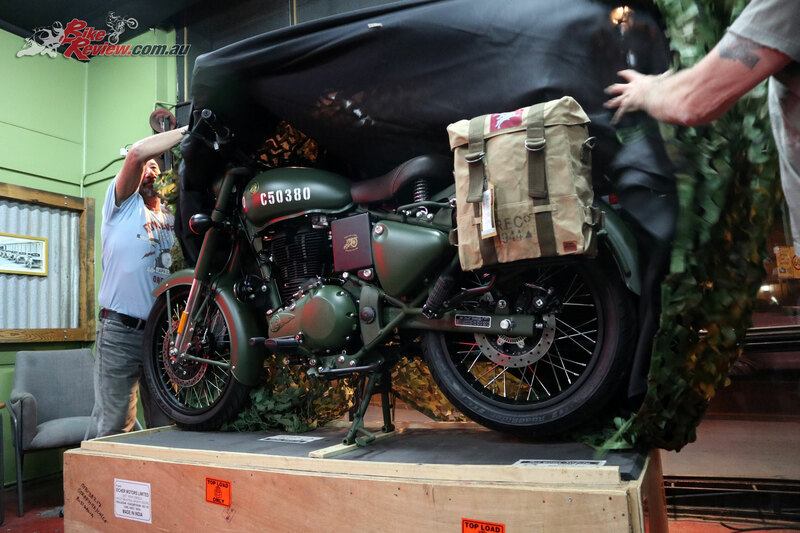 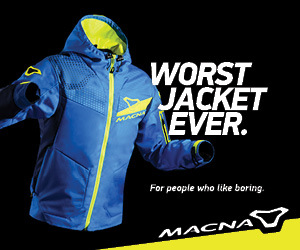 There was plenty of appreciation for the new model. 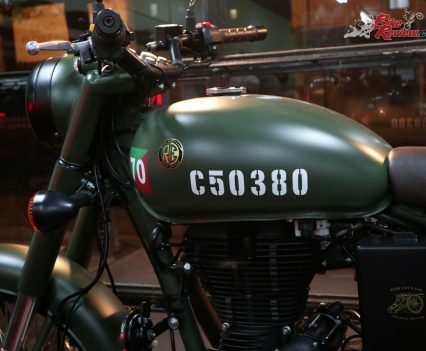 Gibson mentioned something to the effect of it ‘not being about getting there as fast as possible – or you’d choose some other form of transport’, which really highlights the Royal Enfield mentality, there’s no attempt to produce a crotch rocket. 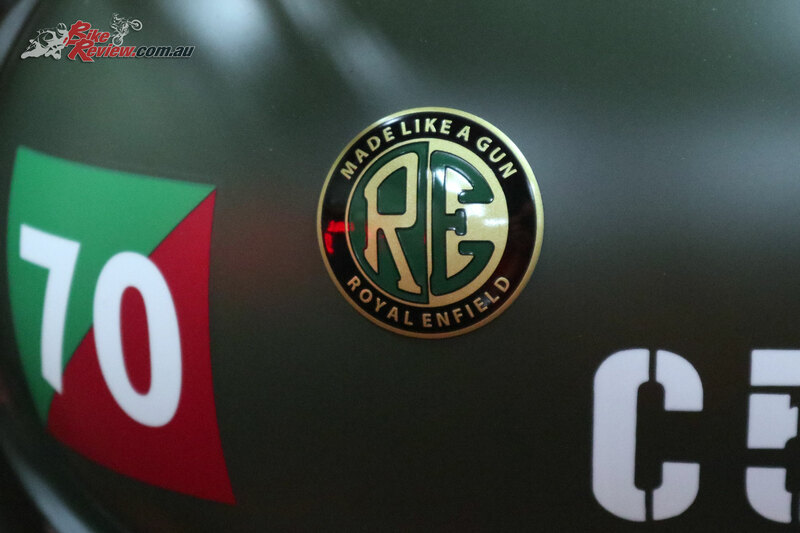 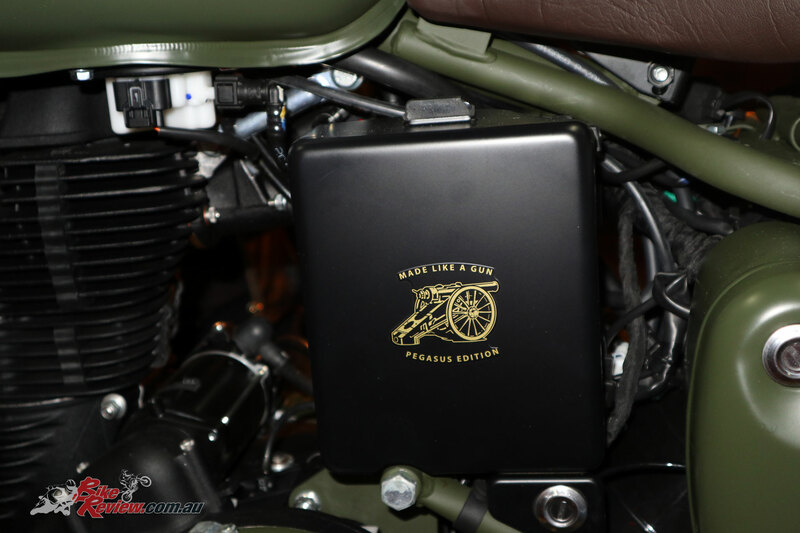 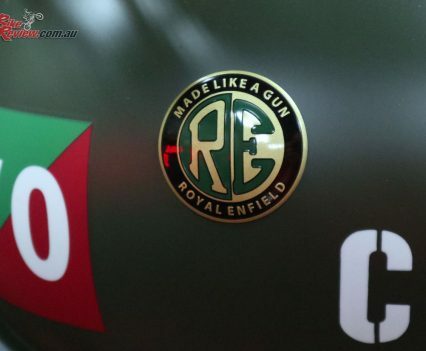 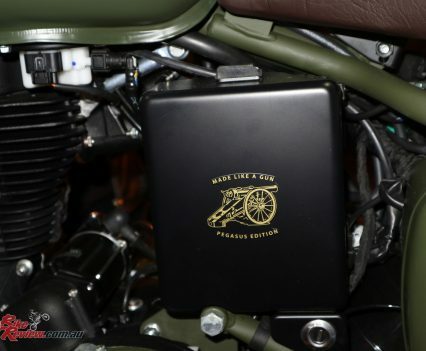 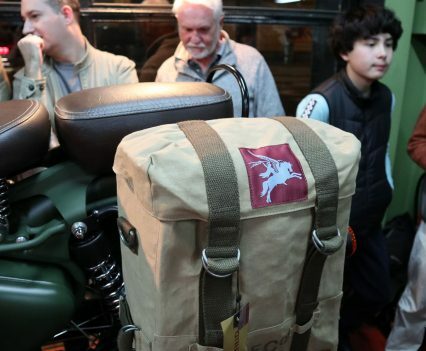 Royal Enfield know what they’re producing and who their target riders are, and keeping their offerings super reasonably priced certainly makes for an easy entry point to the fraternity. 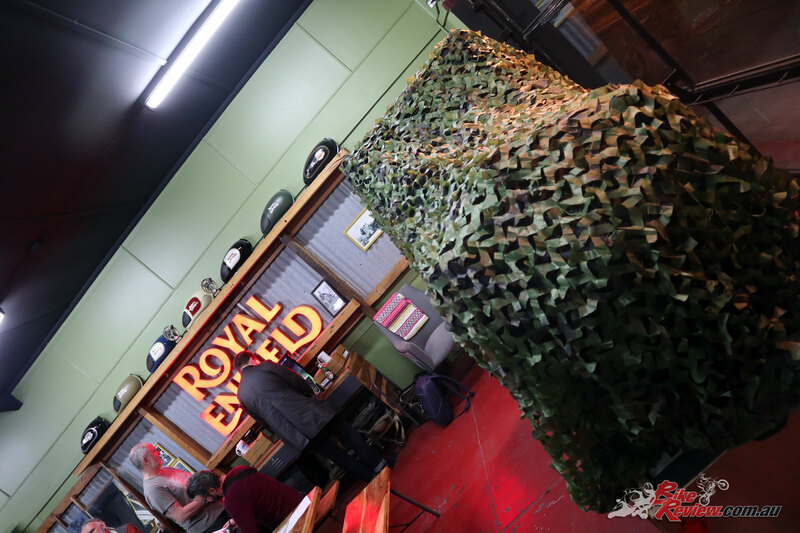 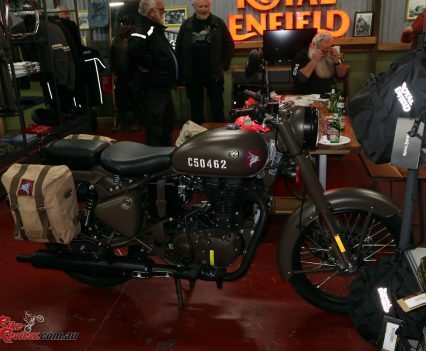 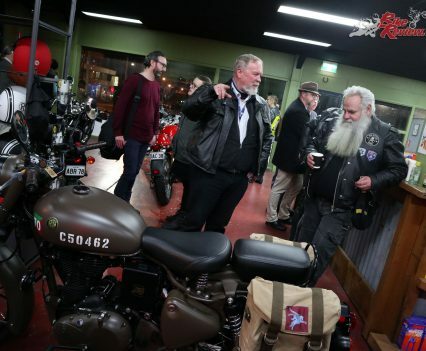 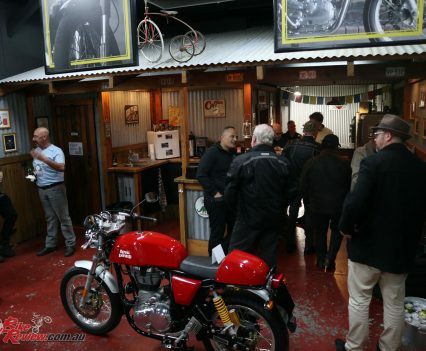 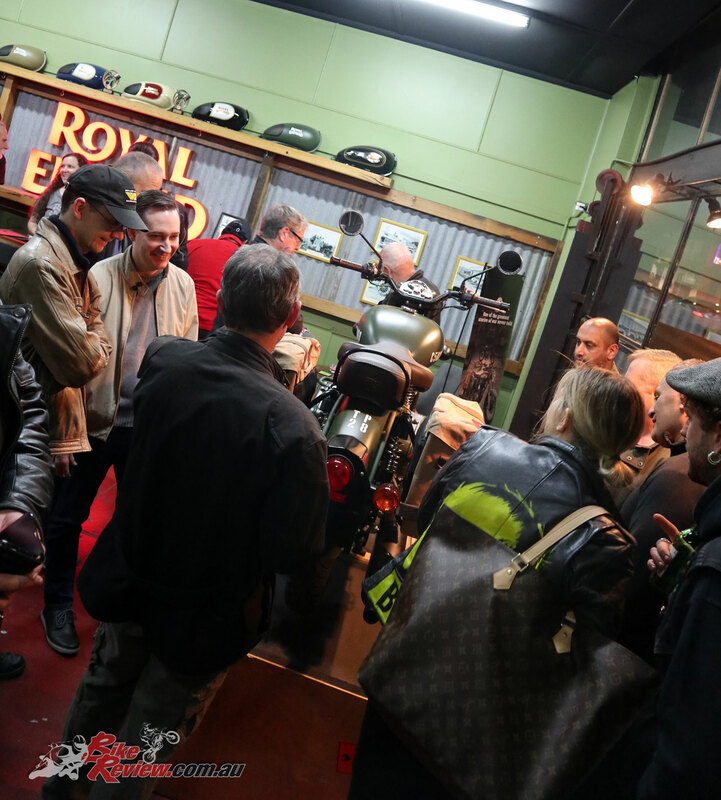 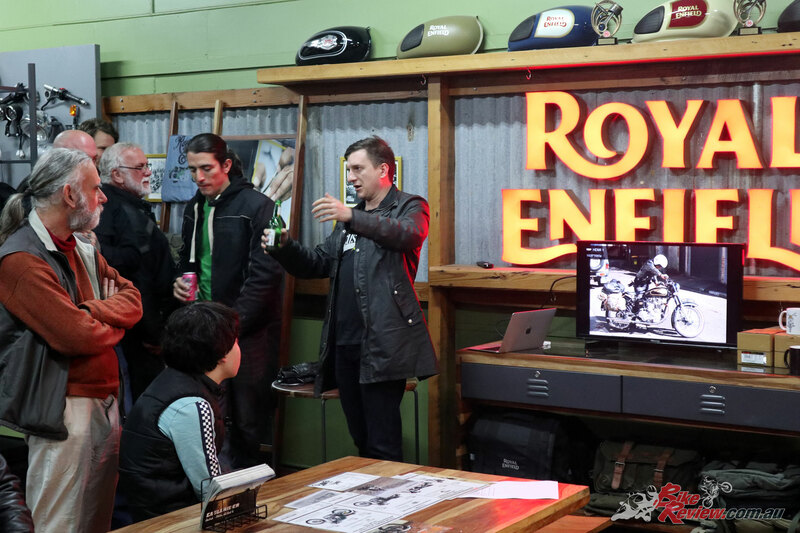 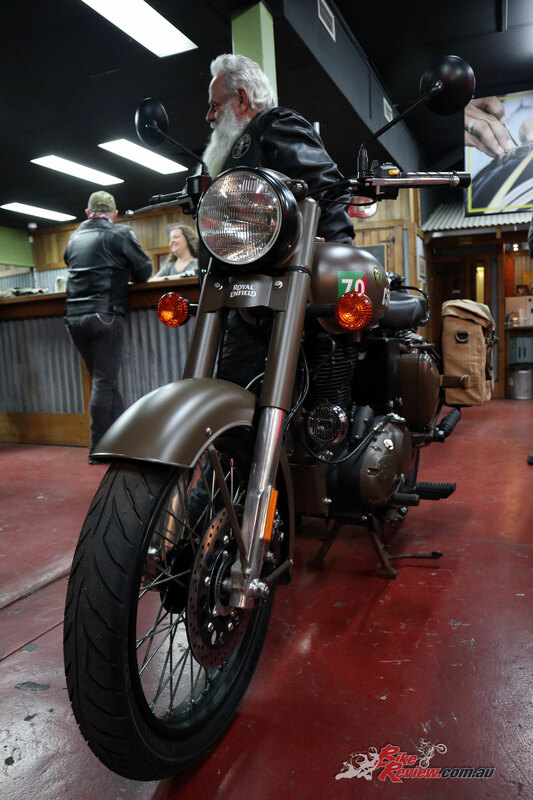 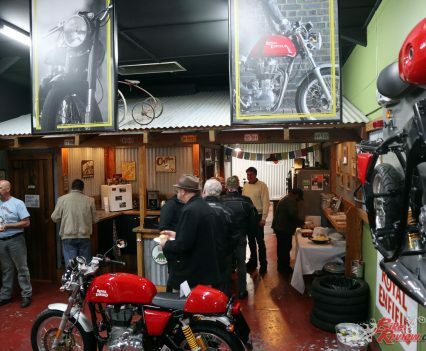 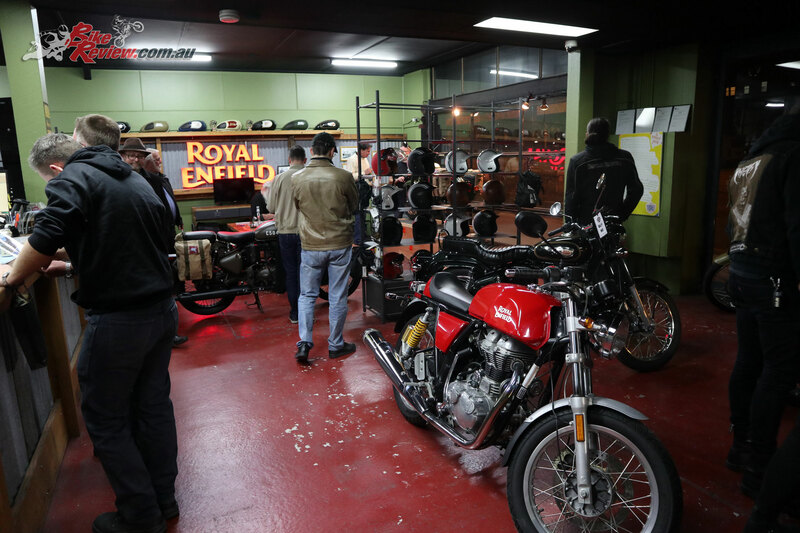 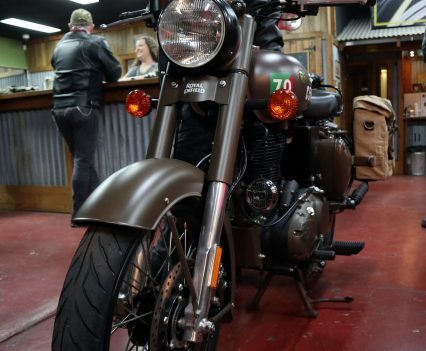 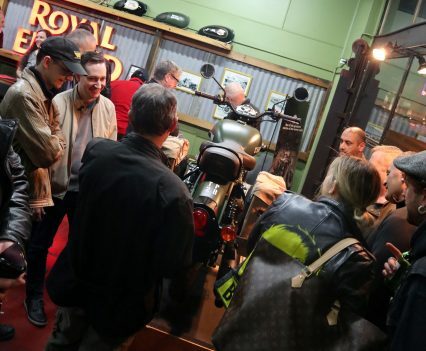 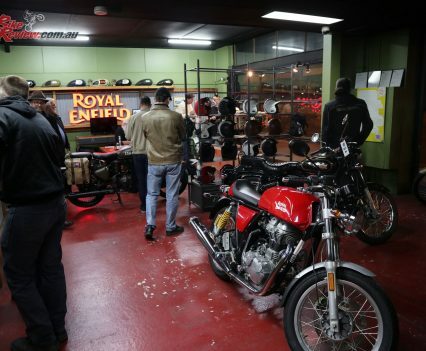 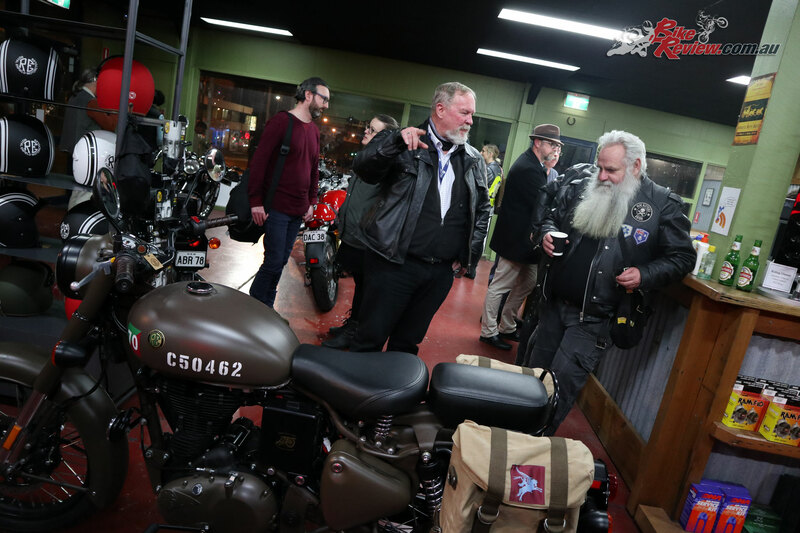 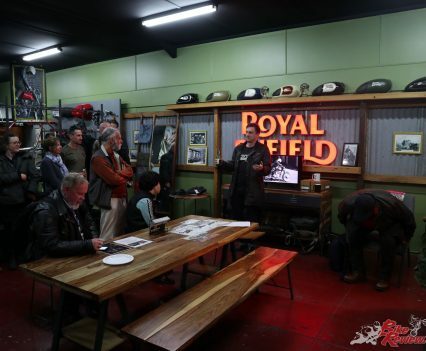 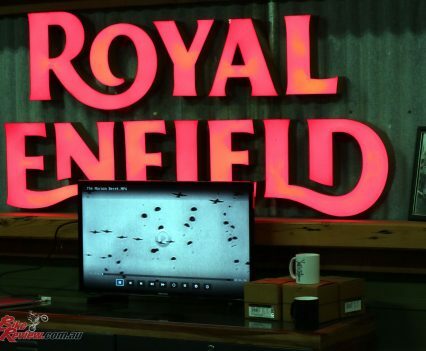 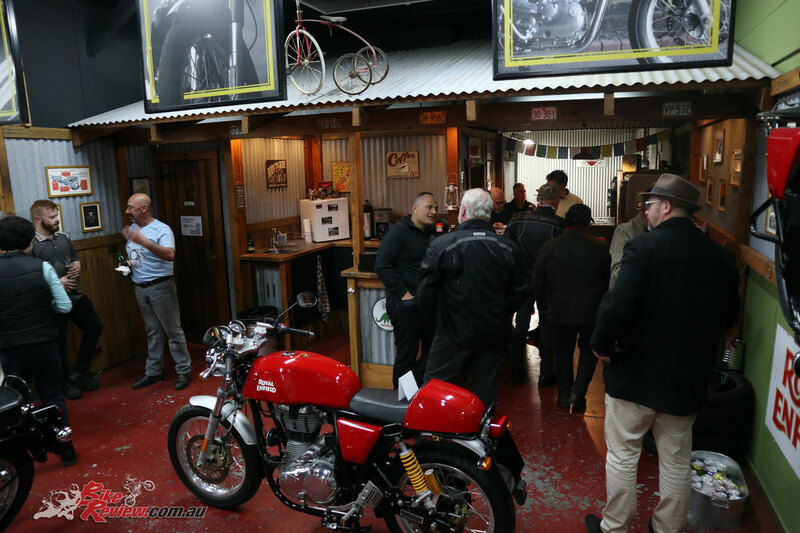 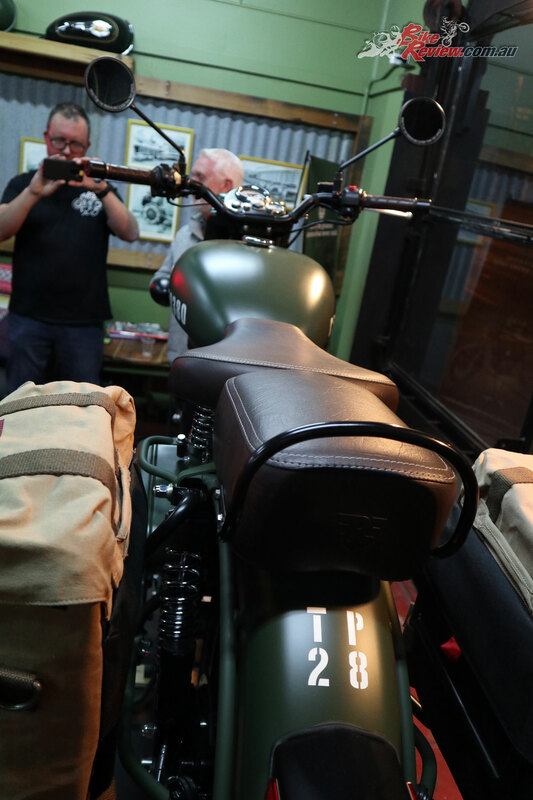 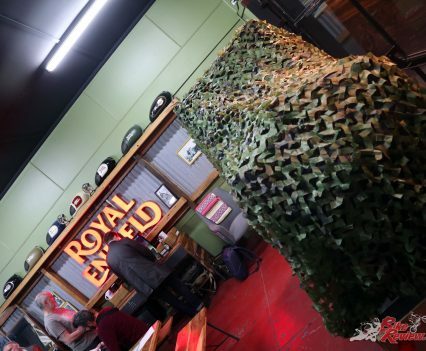 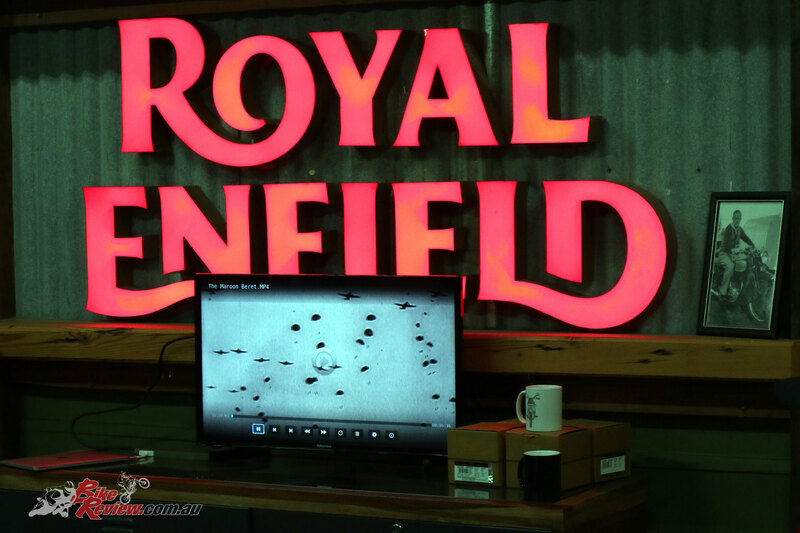 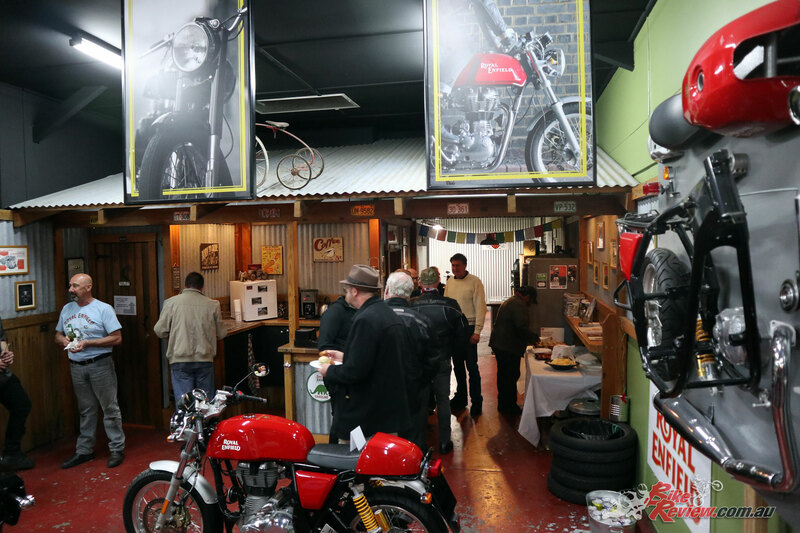 A big thanks go to Royal Enfield Sydney for hosting the event, and putting on a great spread of food and drink, with an amazing atmosphere, as well as to the new owners who were happy for numerous strangers to drool over their brand new motorcycles! 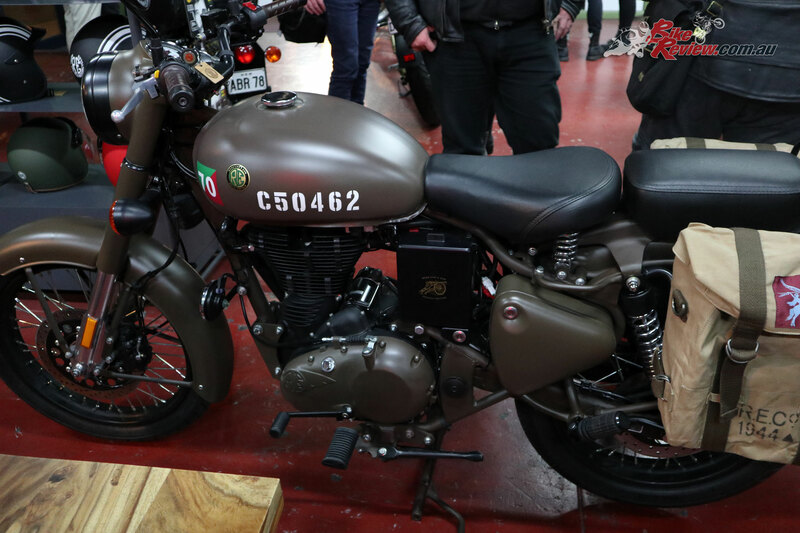 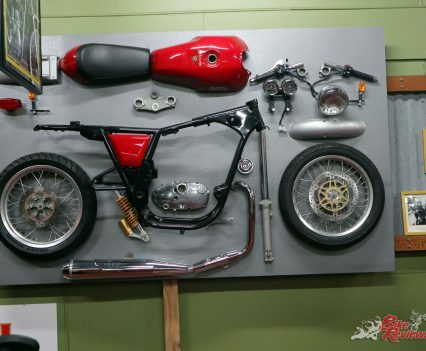 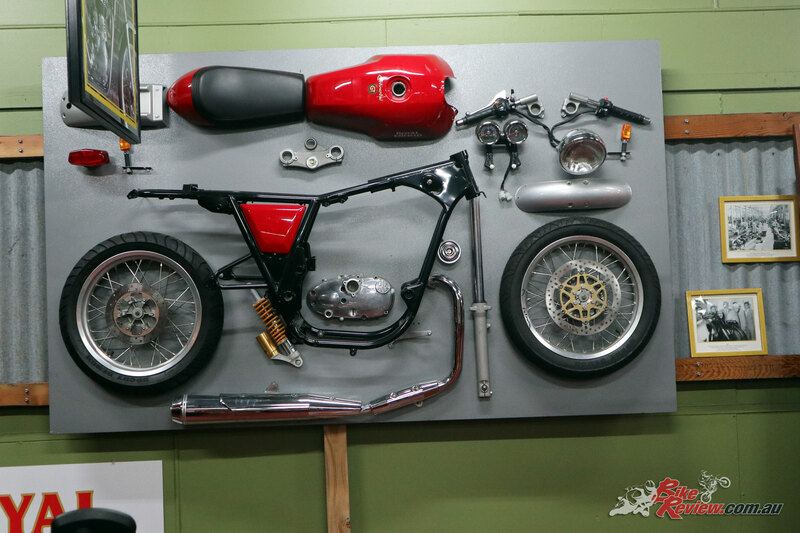 With these models in such short supply, there’s no doubt they’ll inspire many similar custom projects, but it’ll be the lucky owners who’ve got the real deal, with a direct link back to Royal Enfield’s long and rich history. 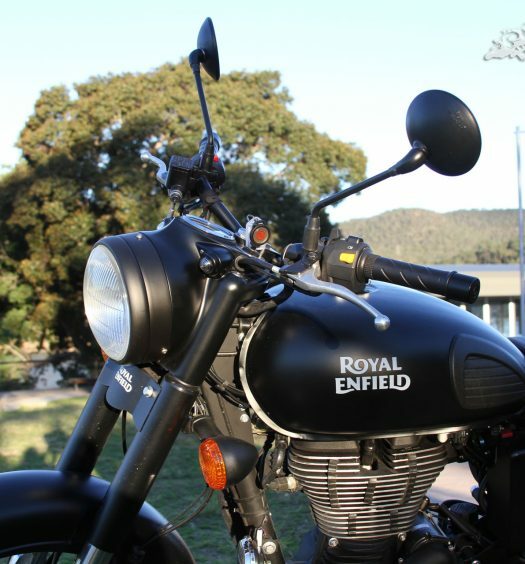 Hi I’m V.Janardhan Naik, I have Royal Enfeild Classic signals edition bike, and I am looking for a Pegasus stickers please. 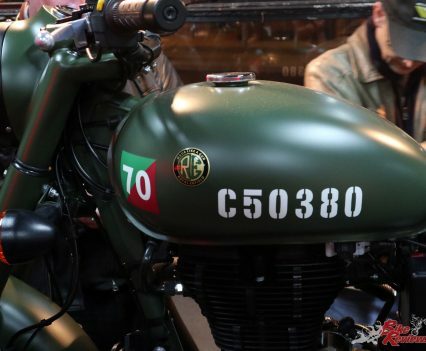 You’d have to check with Royal Enfield to see if those stickers are available, or otherwise have them reproduced.